I’m thrilled with the brand that Barry created for me and the new clientele that we’re bringing in with Facebook Ads! I admit that I was very hesitant as I’m not a technical person, but Barry made it easy for me. He asked all the right questions and next thing I know, everything is designed, ads are running and leads are coming in! All I have to do is add Facebook posts with my phone. It’s easy and my clients are loving it. This campaign is quickly paying for itself! I highly recommend Barry’s branding and advertising services. 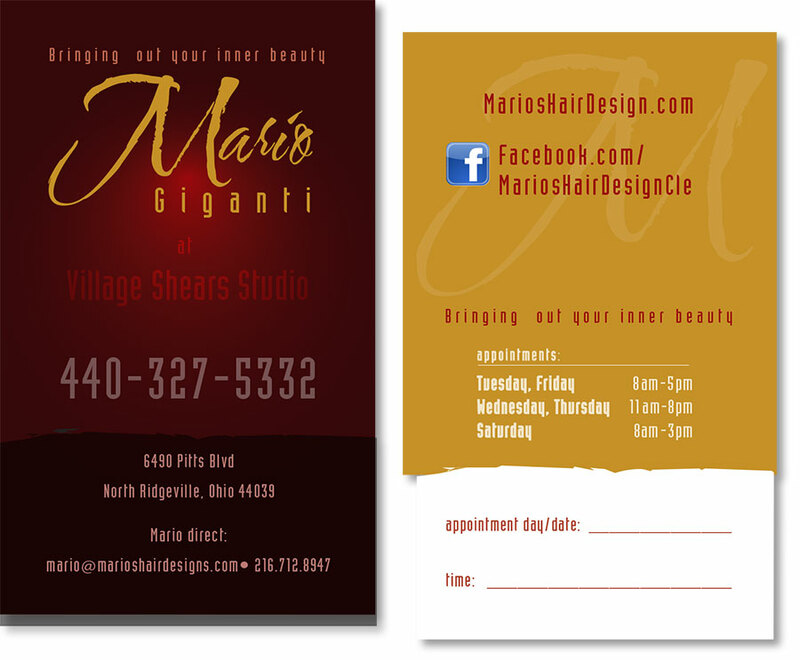 Mario Giganti is a second generation hair artist. His father came here from Sicily as a boy and over the years built a mini empire in the Cleveland area through his beauty salon business. He taught Mario the ins and outs from a young age. He is a very seasoned talent and a true artist. In spite of Mario’s obvious talent, he had lost many clients over the years due to a couple of relocating periods in the past several years. The struggle weighed heavily on Mario and he began to doubt his future in the hair design industry. Mario’s first desire at this stage in his life is to help people. He talked of trying to get into counseling. 1. Discuss creating a shift on his perspective of his business. 2. Create a brand that reflects his level of hair artistry and professionalism. 3. Create a simple website and Facebook Page that will create trust, generate leads and nurture the building of a “tribe” for Mario. Below is a breakdown of the process. I had to take some time to ponder where Mario was stuck in building his business. I ended up writing a blog post about this (“Saving Lives”) a couple months before we finally agreed to take real action. In summary, I had to convince him that he does valuable work in his career. Fortunately, Mario was at a point where he was open to receiving the message and willing to make that shift. As usual for me, I begin brand creation with the business card, as it contains all the necessary messaging boiled down to their essentials – logo, colors, fonts, slogan, etc. The entire look needed to be “modern chic” as Mario specializes in unique coloring, cutting and styling of women’s hair. While we played around with several different slogans, we landed on “Bringing Out Your Inner Beauty” as we feel that this is at the core of our mission. Kind of a secondary slogan that we use in his descriptive material is, “I don’t want to just make you look great, I want to make you feel great!” Again, this drives Mario right to his core motivator – he is brightening up these ladies lives by listening to what they desire and doing everything he can to exceed their expectations. Women take their beauty care very seriously. Mario realizes that and we want everything representing him to reflect exactly that. This part was huge. It was huge in the fact that we kept it lean and as simple as possible, so not to distract from our #1 goal – converting clients. And it’s been an amazing success. 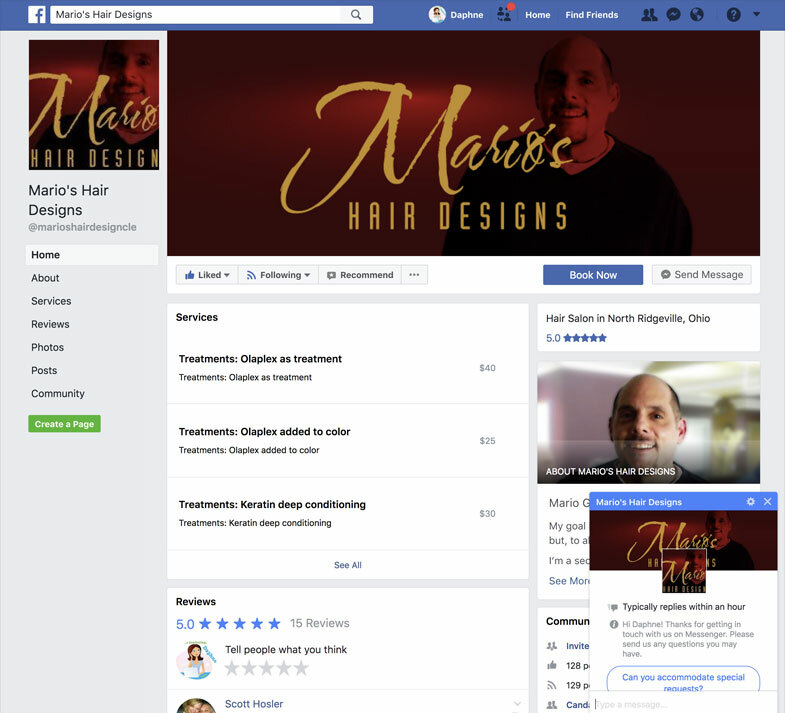 I built the Facebook Page first, as I needed to get Mario up and running and posting client photos and developing some relationships. Mario made it abundantly clear that technology frustrates him very much. I get it. I run into this constantly. I actually brand myself in regards to helping take away that anxiety (See my Over50Starting Over blog). I helped Mario download the FaceBook app, Messenger app, and Facebook Pages app, so he could easily communicate with his Facebook page – responding to comments and upload new Before and After pics and such. He really took to it very, very well. Mario’s Facebook Page. Click to enlarge. Facebook has recently come out with some new AI features which I took full advantage of such as automated greetings, responses to inquiries and bookings, such as “Thank you. I’ll get back to asap…”. But, more importantly, I set up auto-reminders to give clients a reminder message 24 hours before their appointment. And… a “Hey, I haven’t heard from you in a while…” which I set for 4 weeks after their appointment. These are really invaluable features to keep people engaged when you’re only a one man show.